The robotic technology has been shown to improve rehabilitation outcomes when paired with conventional therapy. 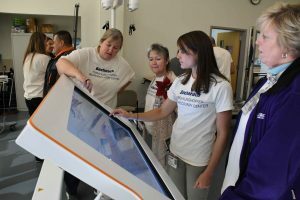 Sharon Grunow, OTR/L, director of Bacharach’s Occupational Therapy Department and Sharrie Rapagna, PT, director of Bacharach’s Physical Therapy Department, were both instrumental in selecting the equipment for the new Center. 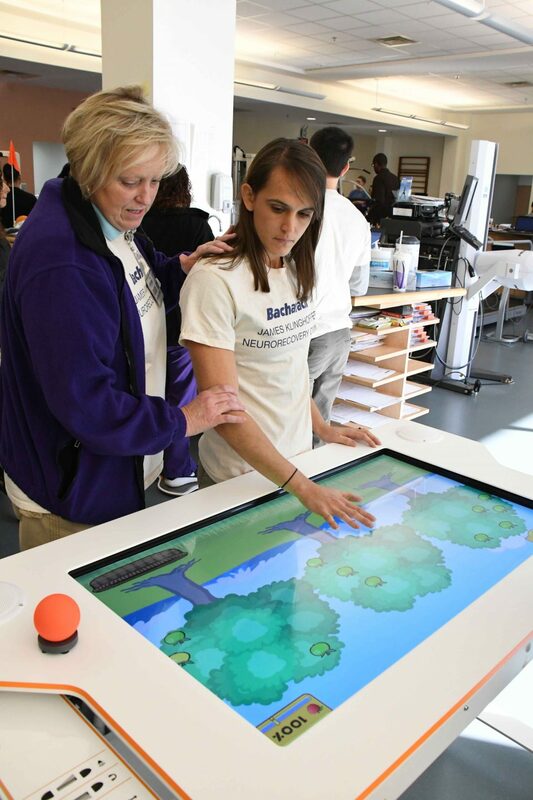 Amadeo: This computer assisted device helps stimulate a patient’s hand by via opening and grasping movements. Using a virtual screen in front of them, patients engage in a game which helps them relax and move their fingers. The device can be customized to work a patient’s entire hand or one finger. Tymo: This device is similar to a balance board and works on balance and trunk training. Patients can use the Tymo while they are sitting or standing. The Tymo helps patients improve posture, static and dynamic movements and equal weight bearing. Myro: This is an interactive surface device that utilizes everyday objects to help patients with everyday life motor training. The Myro can also be used to improve coordination, problem solving and thinking skills. Armeo Spring: This robot helps patients do repetitive upper extremity exercises. It supports the patient through an exoskeleton, which embraces the patient from the shoulder to the hand. The patients can work on increasing their coordination and strength by completing a virtual and repetitive activity. 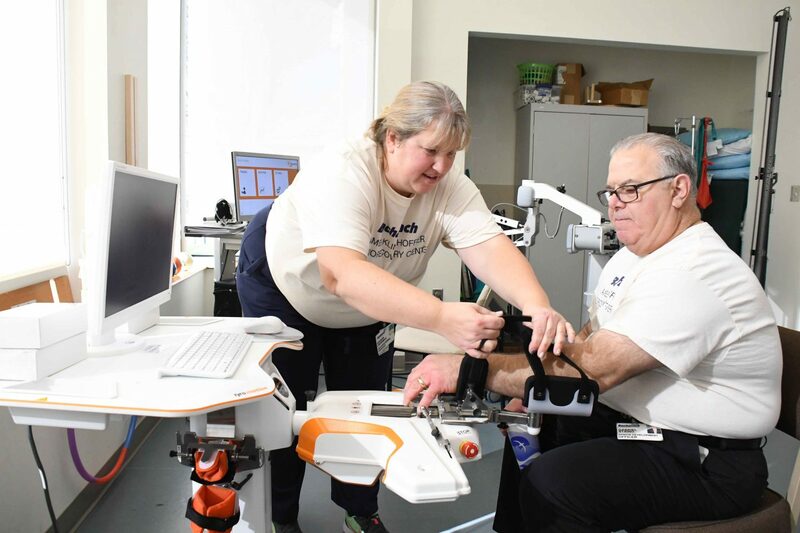 InMotion Arm: This robot-assisted device helps patients work the elbow and shoulder by following different patterns. 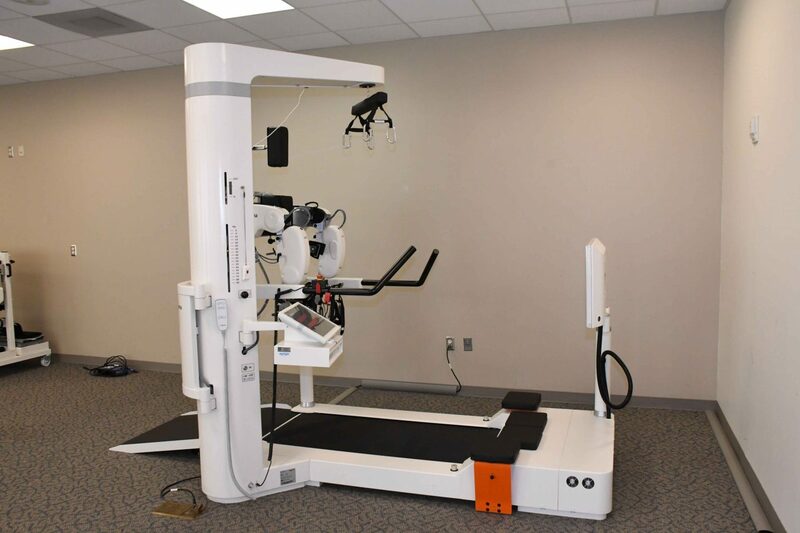 The robot can assist the patient in completing the motion or let them accomplish the task on their own. Sharrie and her team also got together to select and evaluate equipment for the new center. 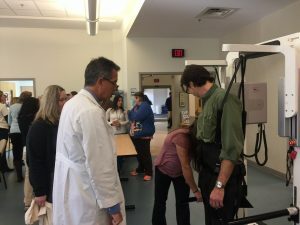 Erigo: This device will be used for pre-gait training for patients who are not used to being in an upright position and who are not quite ready to walk. Patients will lie on their back and be supported on a table, which can be positioned anywhere from lying flat to fully upright. Therapists can gradually increase patients towards an upright position and do so while moving their lower extremities in a stepping motion. 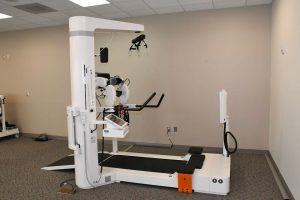 Lokomat Pro: This robotic-assisted gait training device will help patients to work on learning to walk again. 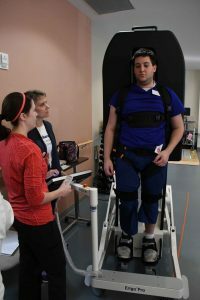 Patients, adult or pediatric, will have their legs secured to an exoskeleton and harness suspension with a treadmill below it. The repetitive gait motion may help the patient’s brain reorganize by creating new neuronal connections. Andago: This is a higher level, mobile gait training device that helps patients bridge the gap between a treadmill base and free walking. The Andago can be directed by a therapist or patient as the patient travels down hallways, in and out of elevators and from room to room. It helps patients build confidence in their walking ability and provides support should they be unsteady or lose their balance. 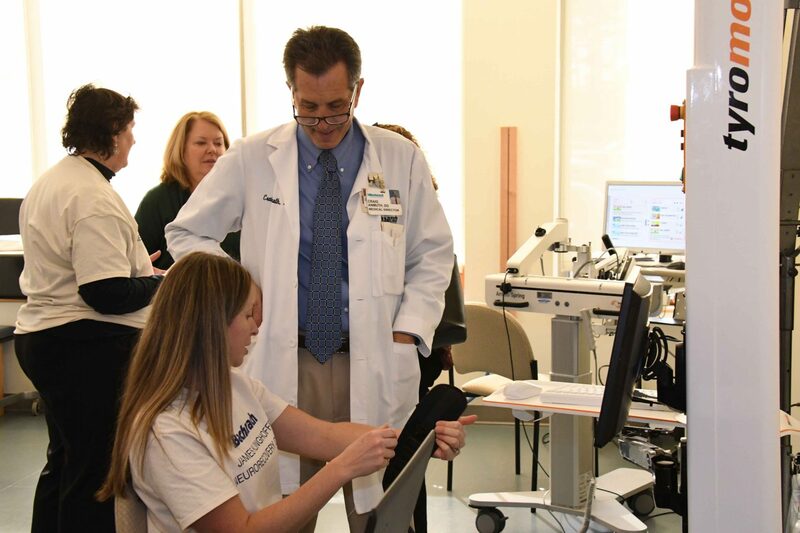 “Our staff is very excited to utilize the new devices to help patients advance in new ways,” said Sharrie. “The selected devices will be helpful to use in conjunction with therapy in order to help our patients to reach their therapy goals.” “We are grateful to be given the opportunity to have this technology to help our patients”. We would like to extend a sincere thank you to James Klinghoffer for his generous donation and to the Bacharach employees vested in learning and utilizing the latest technology.